James Knox Polk defeated Henry Clay in 1844, in a very close election. Then on July 4, 1845, Texas was admitted into the United States as a slave state. However, Mexico still refused to recognize Texas independence. 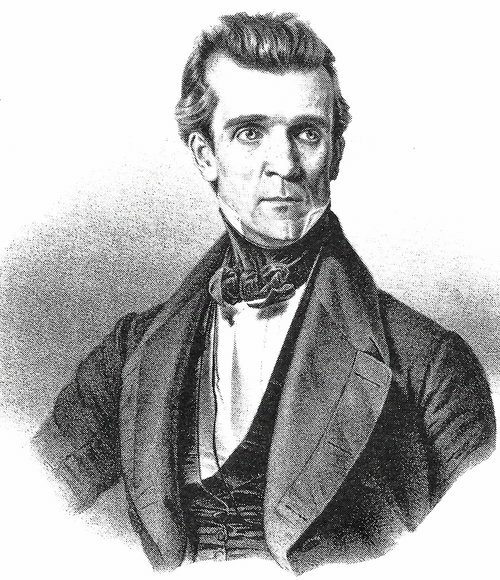 President Polk was a follower of Andrew Jackson's policies and he immediately came out in favor of expansion. President Polk wanted more territory than just Texas. He wanted to control all of Spanish North America. The quick annexation of Texas startled Mexico, which now understood that the United States had an insatiable desire for additional territory. Before long, the two countries were at odds over the location of the border between the two countries. The Texas Democrats demanded all of Texas to the Rio Grande River, while Mexico insisted that the border was the Nueces River. Not long afterward, President Polk attempted to buy ½ of all of Mexico. The Mexican governments answer was clear, they wanted to keep their country. President Polk immediately ordered General Zachary Taylor and 3,500 troops to advance to the Rio Grande River area. His action did what it was suppose to do, it incited the Mexican army to attack. The result was exactly what President Polk expected, 16 men lost their lives and 63 American soldiers were captured. This was what President Polk needed. At once, he declared that Mexico had, “shed American blood on American soil.” Soon afterward, Congress appropriated $10 million dollars and authorized President Polk the authority to call for 50,000 volunteers. The United States won one battle after another against inadequately prepared Mexican forces. Ulysses S. Grant was a lieutenant at the time and he was quoted as saying that the war was “one of the most unjust ever waged by a stronger nation against a weaker nation.” At the same time, President Polk deployed U.S. Army forces into California and New Mexico where they knew that there were few Mexican troops. Shortly afterward, Polk ordered Taylor and ½ of the American army to push the Mexican forces south of the Rio Grande River. Taylor won victories at Palo Alto, Rescaca de la Palma, Matamoros, Camargo, and Monterrey. Soon, Brigadier General Stephen W. Kearny captured Santa Fe, New Mexico before heading to secure California. President Polk attempted to negotiate a treaty, so that further bloodshed could be avoided but Mexico did not want to negotiate. This time, Polk sent Major General Winfield Scott and 14,000 soldiers, along with thousands of volunteers to capture Mexico City. Winfield and his men landed in Vera Cruz, Mexico in March of 1847. He was met by a Mexican army of 25,000, led by General Antonio Lopez de Santa Anna. Scott and Santa Anna met at Cerro Gordo on April 18. General Scott and his men would win when volunteers would rush to their aid. After breaching the Mexican defenses Winfield entered Mexico City, on September 14. The United States signed a the Treaty of Guadalupe Hildalgo with Mexico on February 2, 1848. They received 50% of Mexico and only1% of their population for $15 million dollars. The United States also agreed to pay the citizens with claims against Mexico an additional $3 million. The territories they received included California, New Mexico, Nevada, Wyoming, Arizona, and Utah. As a result, General Zachary Taylor became a national hero and was subsequently elected to the presidency in 1848. During his presidency. the fight over slavery would continue to escalate. Consequently, the issue would help fuel the calls for succession in 1860, and help ignite the Civil War of 1861-65.